Originally established as The African Church, The African Episcopal Church of St. Thomas was founded in 1792 by and for persons of African descent to foster personal and religious freedoms and self-determination. The original African Church was an outgrowth of the Free African Society, a mutual aid organization established in 1787 by Absalom Jones, Richard Allen, and others, to assist the African American population in Philadelphia. Early religious services were held in private homes and in a local school. Along with the founders of the Free African Society, all of the African American members joined together in a historic walk out from St. George’s Methodist Church in 1792 and began developing plans for the purchase of land and construction of a church home. Affiliation with the Episcopal Church was ratified in 1794. The Reverend Absalom Jones became the first Episcopal priest of African American descent and the first rector of St. Thomas’ Church. The original church house was constructed at 5th and Adelphi Streets in Philadelphia, now St. James Place, and was dedicated on July 17, 1794. Subsequent locations of the church included: 12th Street near Walnut, 57th and Pearl Streets, 52nd and Parrish Streets, and the current location, Overbrook and Lancaster Avenue in Philadelphia’s historic Overbrook Farms neighborhood. The congregation has continued to be predominately African American. In 1828, St. Thomas became the first black church in the country to purchase a pipe organ, and the first to hire a woman as organist, 19-year-old Ann Appo. Other notable organists were John C. Bowers and his brother, Thomas J. Bowers. St. Thomas has been continuously working to sustain the legacy of humanitarianism and community outreach passed down from its founders. St. Thomas’ clergy and parishioners have played key roles in the abolition/anti-slavery/underground railroad movements and the early equal rights movement of the 1800s. 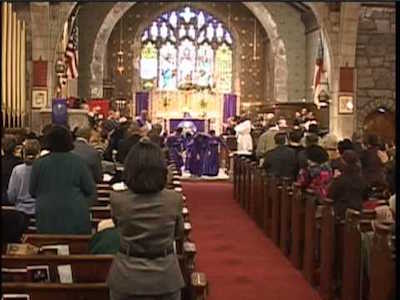 Since 1960 St. Thomas has been involved in the local and national civil rights movement through its work with the National Association for the Advancement of Colored People (NAACP), the Union of Black Episcopalians, the Opportunities Industrialization Center (OIC), Philadelphia Interfaith Action, and The Episcopal Church Women. Most importantly, it has been in the forefront of the movement to uphold the knowledge and value of the black presence in the Episcopal Church. Today, that tradition continues with an ever-growing membership and through a host of ministries such as Christian Formation, the Chancel Choir, Gospel Choir, Jazz Ensemble, Men’s Fellowship, Young Adult and Youth Ministries, a Church School, Health Ministry, Caring Ministry, and a Shepherding Program. On November 10, 1996, the church dedicated the Absalom Jones Chapel with a Festal Eucharist and enshrined his ashes in the altar inside the church sanctuary. In addition, the Absalom Jones Memorial Stained Glass Window was installed and dedicated in July 1997. A stained glass window featuring Black Saints, and Black Bishops past and present was also installed in 2000. St. Thomas has had 17 Pastors in its 223 years of continuous ministry. Currently the Rector is Rev. Martini Shaw. Robert Fulle, “A history of St. Thomas African Episcopal Church, 1794-1865, Philadelphia, Pennsylvania” (Philadelphia: University of Pennsylvania Press, 1986); Matthew S. Hopper, “From refuge to strength: The rise of the African American church in Philadelphia, 1787-1949,” Preservation Alliance for Greater Philadelphia, www.preservationalliance.com/files/aachurches.pdf; St Thomas Episcopal Church, www.aecst.org.